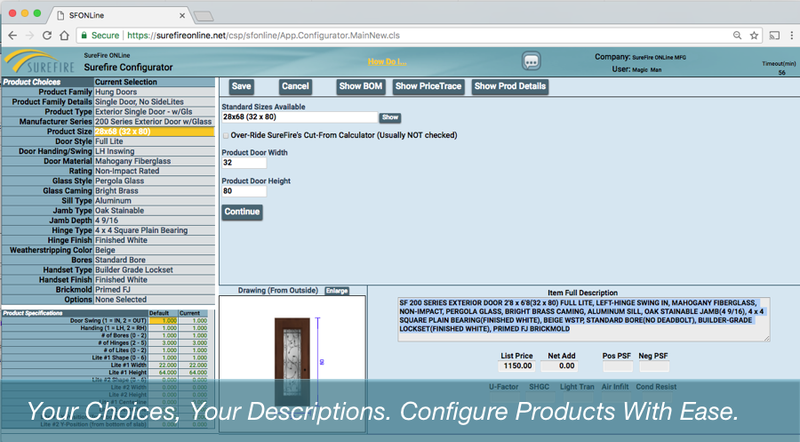 Configure Products with (Literally) a few clicks. Auto-Select System makes choices based on the defaults YOU choose. Then, ONLY change what you need to. 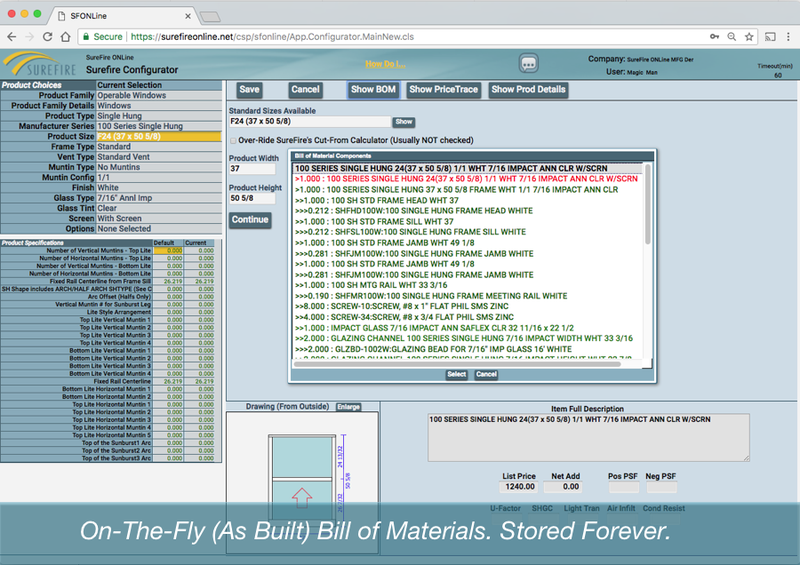 Live Configurations - As you make changes, the drawings descriptions and even bill of materials updates on the fly. Configure Multi-Unit Openings, Customize Muntin Patterns and Locations. Endless Power To Customize Every Product Detail. Look Uber-Professional and Let the Customer Do the Work. 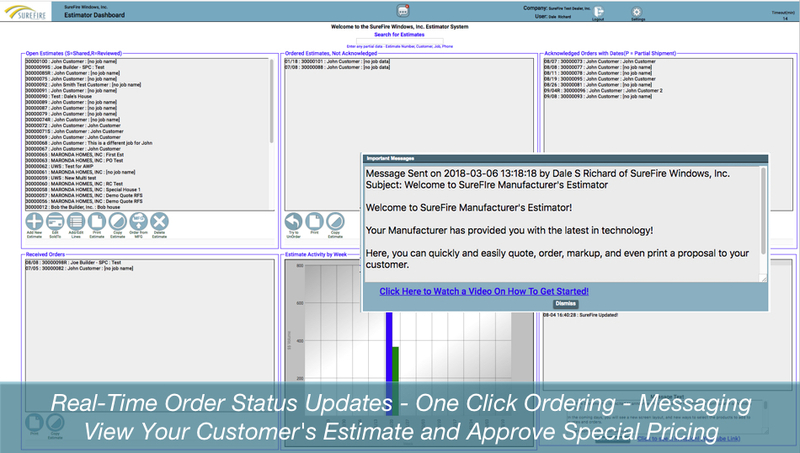 With SureFire Estimator Built-In, Take Orders ONLine on Day 1. Completely Branded - Look like a million bucks. All the power of the SureFire Product Configurator at your Customer's Fingertips. Access your dealer's quotes with Sharing Center, and Approve Special Pricing Requests Live! Easy 1 Click Ordering Process for the Customer. Login Accessible via your Existing Website. Orders populate right into your existing MFG ONLine System. Set Customers Up with Just an Email Address in Minutes. Nothing to Install! Full Bill Of Materials - Never Build it Wrong. Configure any product and click "Show BOM". It's that simple. Have a Glass Replacement from Three Years Ago? Call up the Order, Select the Glass and Click Save. Select any Part in the List to Add to an Order Line. Always Live Configurations - Change a Size? All Parts immediately reflect the change. Never, EVER Run Out Again. 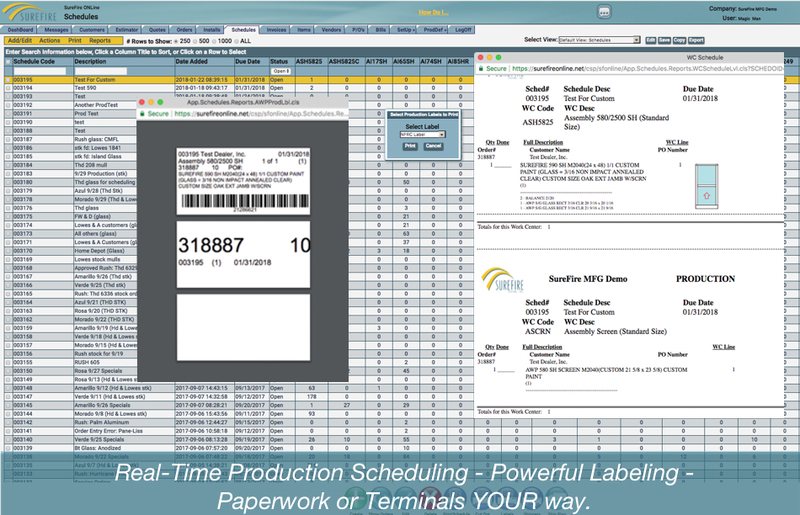 Let SureFire ONLine MFG Track Every Bit of Raw Material Usage in Your Plant - In Real Time. 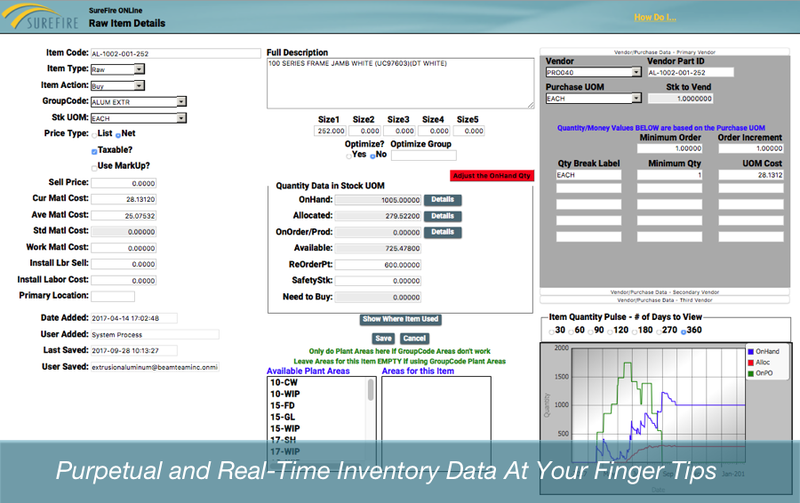 Up to the Second On-Hand Inventory Reporting Allows you to Purchase Just in Time - And Never Late. Full Purchase Order Receiving, Invoice Verification, and Accounts Payable Interfacing! A Logical Approach to Logistics. Plan your ship Routes, Trucks, Drops and Build a Ship Plan that works for you. See the ship plan for a day, a week, or a month at a time. Click to drill down into the orders for any day. 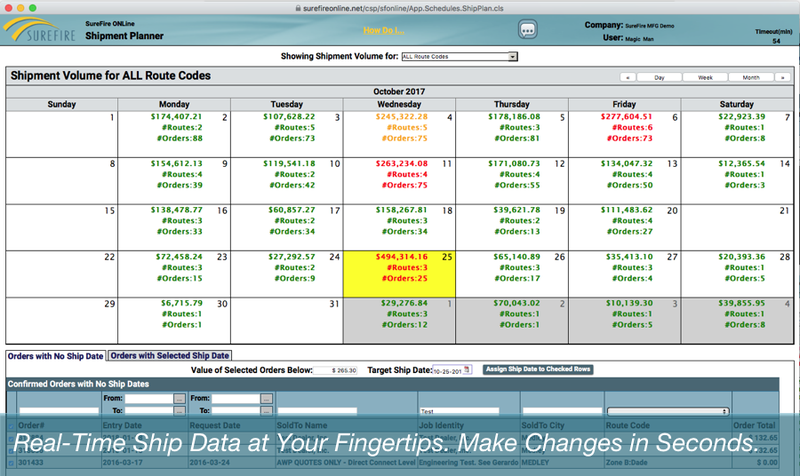 Make changes to 100 orders in three clicks. Barcode scan on and off trucks. Real-Time tracking. Backorder alerts to your phone via text/email/in-system. Real-Time Production Reporting - Production Status Live at your Desk. Plan Production in Advance, then Execute when the Time is Right.